Before the start of her wedding ceremony in St. Paul's Church in Port Gamble, Washington, the bride was hiding in the historic church's tiny second-floor balcony. 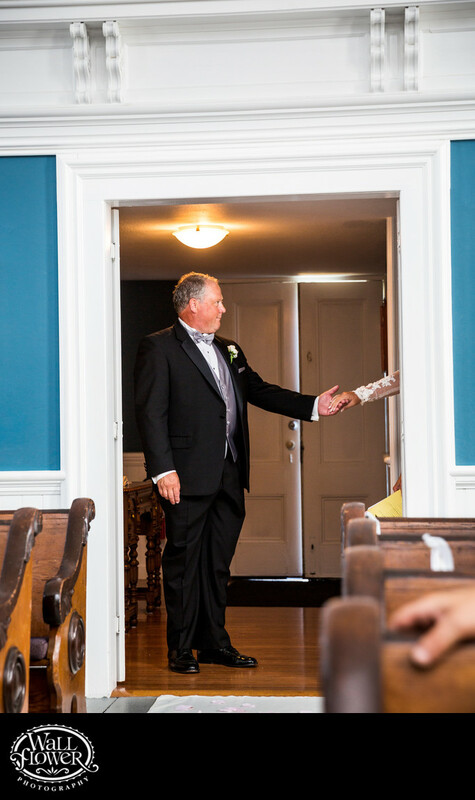 After the groom and the rest of her wedding party had processed down the aisle and were waiting for her, she descended the stairs to where her father waited to walk her down the aisle. I snapped this photo just as she reached out to take his hand, but before her face and the rest of her body came into view. This photo won an award in a wedding photography competition held by the Wedding Photojournalist Association (WPJA).